The church was founded when the Rev. 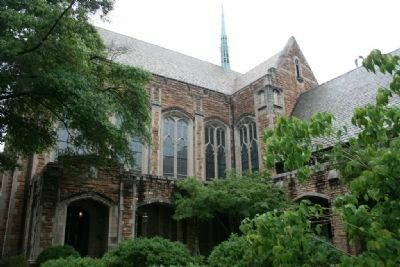 Henry M. Edmonds and many members of a Southern Presbyterian congregation withdrew from the local Presbytery. 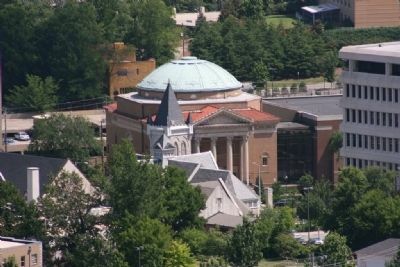 During the first seven years it met in Temple Emanu-El synagogue and held evening services in the Lyric Theater downtown. 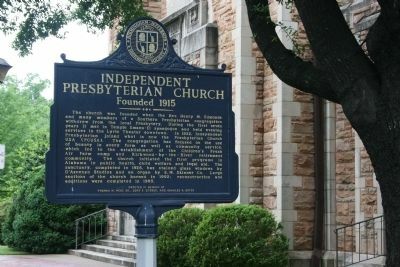 In 1922, Independent Presbyterian joined what is now the Presbyterian Church USA (PCUSA). The congregation has focused on the use of beauty in every form as well as community service, which led to the establishment of the Children’s Fresh Air Farm camp and Kirkwood - by - the - River retirement community. The church initiated the first programs in Alabama in public health, child welfare and legal aid. 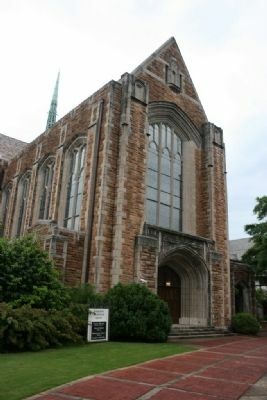 The sanctuary, completed in 1926, has stained glass windows by D' Ascenzo Studios and an organ by E. M. Skinner Co. Large sections of the church burned in 1992; reconstruction and additions were completed in 1995. Erected by Birmingham - Jefferson Historical Society. Location. 33° 30.48′ N, 86° 46.776′ W. Marker is in Birmingham, Alabama, in Jefferson County. Marker is at the intersection of Highland Avenue South and 31st Street South, on the right when traveling west on Highland Avenue South. Touch for map. Marker is at or near this postal address: 3100 Highland Avenue South, Birmingham AL 35205, United States of America. Touch for directions. Other nearby markers. At least 8 other markers are within walking distance of this marker. A.B. Loveman House (approx. 0.2 miles away); The Coe House (approx. 0.2 miles away); Donnelly House (approx. 0.2 miles away); Jordan Home (approx. ¼ mile away); Site of the First Alabama - Auburn Football Game (approx. 0.3 miles away); St. Vincent’s Hospital (approx. half a mile away); The Little Theater Clark Memorial Theatre Virginia Samford Theatre (approx. half a mile away); Redmont Park Historic District (approx. 0.7 miles away). Touch for a list and map of all markers in Birmingham. The building with the dome roof. The Temple is located at Highland Avenue South and Richard Arrington Blvd South near Five Points South. 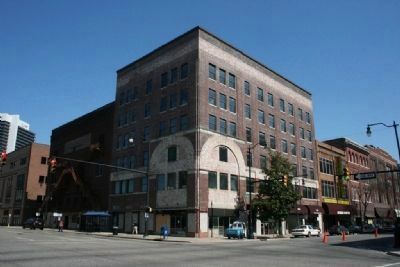 Built in 1914, the Lyric Theatre is a former vaudeville and movie theater located on the corner of 3rd Avenue North and 18th Street North downtown Birmingham. More. Search the internet for Independent Presbyterian Church. Credits. This page was last revised on July 25, 2018. This page originally submitted on February 1, 2010, by Timothy Carr of Birmingham, Alabama. This page has been viewed 1,429 times since then and 7 times this year. Photos: 1, 2, 3, 4, 5. submitted on February 1, 2010, by Timothy Carr of Birmingham, Alabama. • Craig Swain was the editor who published this page.